On Saturday, Oct. 7, construction crews began tearing down the former Citizens Bank building on Grand River and Abbot after many years of vacancy. That should make Grand River Avenue look better by the end of the month. 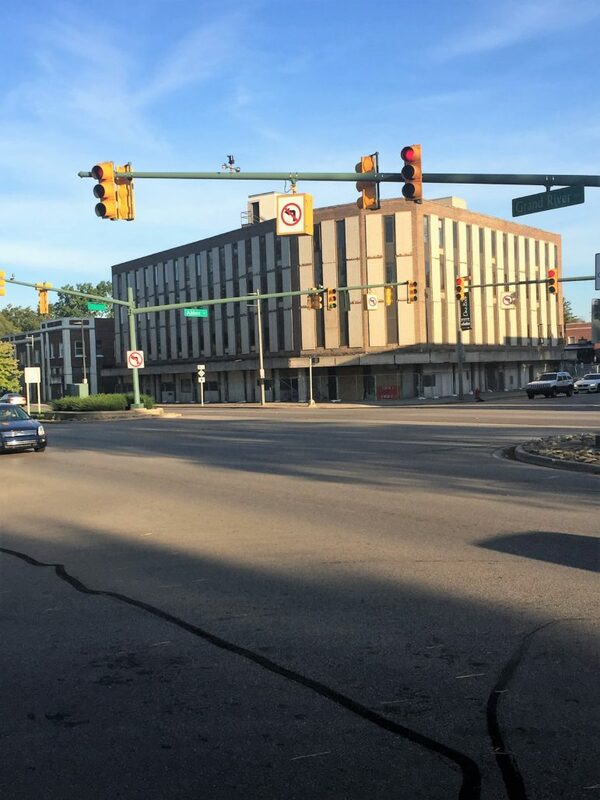 The decision to move forward was made by East Lansing City Council after Convexity Properties committed to continuing demolition of the properties at 100-140 W Grand River Ave. as originally planned. Nick Simowski a 2014 graduate of Michigan State, said that it is great that something is finally being done about the buildings that he said, have been sitting empty for so long. The project that the East Lansing City Council had approved for the Park District area will not be moving forward because the current and former developers were unable to reach an agreement on the transfer of a Michigan Business Tax credit for this project. Justin Dollar, a senior at Michigan State who spends a lot of time on Grand River, said it is a great idea for something to finally be done about the buildings. Convexity Properties, the Michigan Economic Development Corporation and the City of East Lansing were trying to resolve the issue, but were unsuccessful. The city expects developers to submit plans for a revised project in the coming months. Josh Lange, a Boyne City native, said he hopes that once the demolition is done that the city developers could continue with something similar to what was planned for the site. Empty Building at the corner of Grand River and Abbot. The Buildings of 100-140 W Grand River Avenue will come down Beginning Saturday October 7th. Lauren Gewirtz is a journalism major with a concentration in sports and a minor in graphic design. She works at The State News as an editorial and advertising designer and also writes for a website called Last Word on Sports, where she covers the NBA and NCAA basketball. Kaleb Kraus is a graduate of the Journalism School at Michigan State University. Kaleb aspires to be a Sports Play by Play Announcer. Kaleb has skills including speaking, leadership, and a vast knowledge of many sports including basketball, football, among others. Kaleb is a very kind and caring person and is always ready for anything. Kaleb is always on time. An art museum has made it’s way onto Grand River, but it’s not your typical one-stop shop. The Art Lab is a creative and collaborative art museum, where people can be involved hands-on or just visit the art pieces.